DOMESTIC GODDESSES: So what's all the fuss about? For the last few years I keep seeing red velvet cakes all over, in bakeries, blogs and magazines. Looking at the recipe it doesn't sound like a particularly earth shattering arrangement of ingredients. In fact, aside from the cool red colour contrasted with white icing, I couldn't see what all the fuss was about. Then a client asked me to make her one for a special luncheon. I set about finding the best possible recipe and I think it turned out pretty well. It seemed to me that the secret to this cake, aside from the cool colour, was all in the icing. The cake itself is relatively neutral in taste but needs to be light and silky in texture. The best icing recipe I could find is a variation on a simple cream cheese icing. But it really does take it to a new level. Pure sin - but I feel if you're going to eat cake you may as well make it worth it. Pre-heat your oven to 175˚C and place the rack in the center of the oven. Butter a 23 - 25 cm round cake tin and line the bottom with wax paper. Set aside for later. In a mixing bowl sift together the flour, salt and cocoa powder. In a measuring cup whisk the buttermilk, oil, red food coloring and vanilla and set aside. In the bowl of your electric mixer or with a hand mixer, beat the butter until soft (about 1-2 minutes). Add the sugar and beat until light and fluffy (about 2-3 minutes). Add the eggs, one at a time, beating well after each addition. Scrape down the sides of the bowl while mixing. With the mixer on low speed, alternately add the flour mixture and buttermilk mixture to the butter mixture. Add half the flour, then all the buttermilk, then the last of the flour combining in between. In a small cup combine the vinegar and bicarb. Allow the mixture to fizz and then quickly fold into the cake batter. Pour the batter into the cake tin and smooth the top with a spatula or the back of a spoon pushing it slightly up at the sides of the tin. Bake in the pre-heated oven for approximately 30 - 35 minutes, or until a knife inserted in the center of the cake comes out clean. Cool the cake in its tin on a wire rack for 10 minutes. Place a wire rack on top of the cake pan and invert, lifting off the pan. Remove the wax paper. Once the cake has completely cooled, wrap in plastic and place the cake in the fridge for at least an hour or overnight. To make the cream cheese icing, whip the cream until stiff. In a separate bowl whip together the cream cheese, mascarpone cheese, vanilla and icing sugar. Once well combined fold the whipped cream into the cream cheese mixture. Refrigerate until ready for use. When you are ready to assemble the cake, cut the cake in half, horizontally. I like to use the underside of the cake as my top surface as it has a flat and even top. You can trim the rounded part of the cake off to make a flatter bottom. Spread the bottom cake layer with a thick layer of icing. Cover with the top layer and continue to ice the whole cake, top and sides. Decorate the cake as you wish. 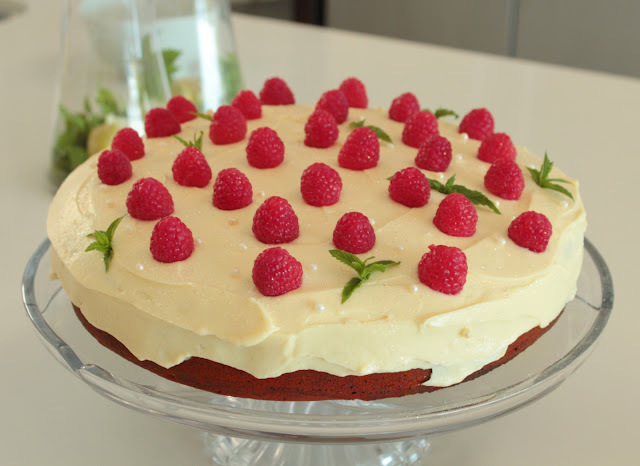 I think raspberries and mint leaves finish it off beautifully.